This year's packaging is the first "human-sized prop" package we've gotten since Thor. The Book of the Vishanti is the greatest repository of white magic on Earth (its black magic counterpart is the Darkhold), and this box represents it. Its covers are designed to look like leather, and inside there are spells and drawings of the characters. It's a huge item, measuring 14¼ x 16¼ and 3" thick. It's so big, you'll want a library-style podium to hold it! Our first figure is, of course, Dr. Strange. He's had a Marvel Legend before, and will again - this figure is a prepaint of a figure that will be in the second series of Avengers 2 figures. Gone are the Spawn-cape and the pirate shirt; this is his modern costume, worn after Fear Itself as a member of the Defenders. Gone are the Spawn-cape and the pirate shirt, replaced by a simple, modern garment made exotic by the long skirt that hangs off the jacket. We'd call it tails, but it doesn't split in two. He has a flowing sash, and appears to be wearing the Eye of Agamotto as a belt buckle. The arms and legs come from Hasbro's small body, but the torso is new - it's smooth enough to look like clothes instead of muscles. The normal figure will be black and red, but this one is special. 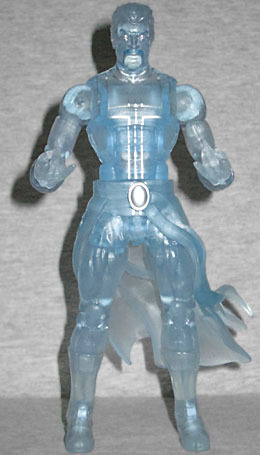 This one depicts Stephen in his astral form, so the figure is cast in a translucent smoky blue-grey plastic meant to make him look like a ghost. There's silver paint to create details on the shirt and belt buckle, as well as the eyes. His mustache and eyebrows are solid blue. As we predicted, the magical effects that came with Scarlet Witch have been repurposed for Dr. Strange. This time they're cast in a solid silver plastic, to go along with his spiritual energy. The larger interior rings fit around his wrists so that the circles will appear to hover around his hands. Very fun! Feeling he was no longer worthy, Dr. Strange once renounced his position as Sorcerer Supreme. The Eye of Agamotto disappeared to find a replacement, and that replacement was Brother Voodoo. He is Lord of the Loa and Houngan Supreme. Jericho Drumm became the powerful practitioner known as Brother Voodoo in an ancient ritual performed by Papa Jambo, wherein his soul was bound to the Loa of his deceased brother, Daniel. Brother Voodoo's direct connection to the spirit realm makes him an incomparable ally when combating malevolent spirits and undead enemies. Part of Marvel's '70s horror rush, Brother Voodoo had been kicking around the comics since 1973 without ever doing anything of note, so making him Sorcerer Supreme was kind of a cool idea. He's wearing a black suit with stylized white bones on the chest and legs, and has obviously inherited the Cloak of Levitation - it's made from Grim Reaper's cape, and has lost the fancy gold edging, but gets a new piece around the neck with the Eye of Agamotto and... some chicken bones? He finishes his look off with golden wristbands and a long green sash that hasthree odd skulls hanging from it. The head is new, and damn impressive. Part of Doctor Voodoo's shtick has always been that he had a streak of white running through his hair - it was true when he had a little afro, and it's true now that he has shoulder-length dreads. His face is painted with the skull motif he wore briefly during his 2009 series, and the circle-V scar on his forehead is done with green. 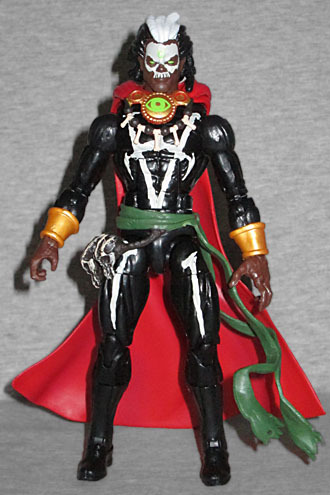 Brother Voodoo was one of the figures eligible to get a Marvel Legend on that 2009 ballot where the fans bravely banded together and dared to throw their vote at the thing that was always going to win in the first place. Honestly, it's like they never heard of tactical voting. 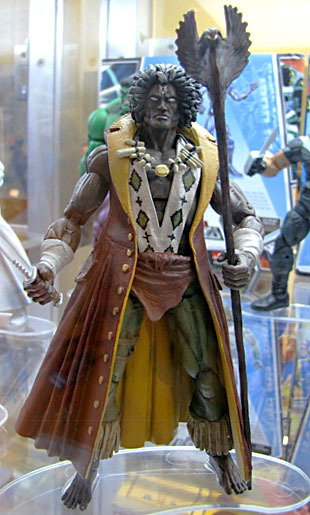 Anyway, that figure (seen here in the display case at San Diego Comic-Con 2009) would have come with Adam Warlock's bird-stick, while this one gets a new mold for his Staff of Legba. It's a crooked branch, cast in translucent green plastic but painted brown at the bottom so it looks like it's fading into energy. In the comics, there are two shrunken heads hanging from the staff, but here, they look more like tiny demon heads. There's a bit of a dry-brushing on them to help accentuate the details of the sculpt, which might otherwise be lost in the see-through plastic. It's a little too wide for his hand, but still a wise accessory. An ancient and heinous being, master of all the mystic energies of the Dark Dimension, Dormammu is the fiery demon who possessed The Hood and set the streets of New Orleans ablaze in search of the Eye of Agamotto. And he will come for it again. The Dread Dormammu was one of Dr. Strange's first recurring villains, probably the most famous foe he's ever had, and yet until now the only toy Dormy had ever gotten was a mediocre repaint in 1999. If you wanted something to go with your Marvel Legends, you had to resort to a giant HeroClix figure. But no longer! 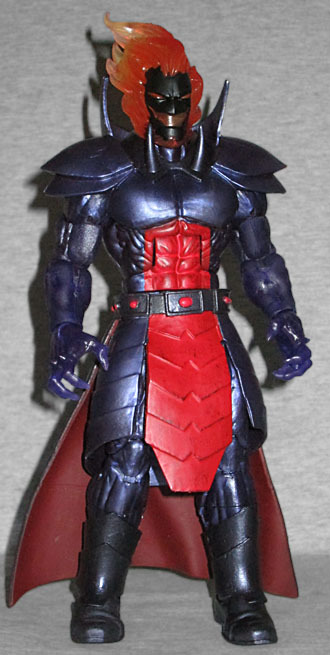 This figure is based on Dormammu's modern look, which does away with the pink jumpsuit and red gloves in favor of a combination of robes and armor, befitting an evil sorcerer. The skirt, shoulder armor and greaves are new pieces that fit over the existing body, and the hands are new, too: they're both open, and clawed, and have spikes on the knuckles. His head is clearly new, since it's a black face wreathed in flame. The highest point of the flame breaks the 8¾" mark. 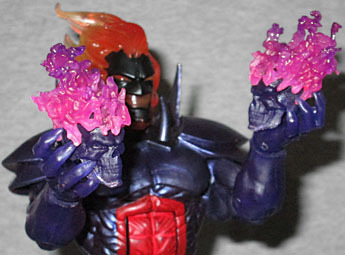 The set includes two accessories that we assume are meant for Dormammu - at least, they're molded from the same translucent purple as his hands. He's often shown with flaming fists, to match his flaming head, but this toy takes thing up a notch by giving him two flaming skulls to hold! They're taken from Ghost Rider, and the flames are pink. They're a bit small for his hands to hold reliably, but it's definitely a creepy look for him. Magik is the ruler of Limbo and wielder of the Soulsword - a blade with mystical power that is able to slay supernatural beings. She can teleport through time and space and is an extraordinarily powerful ally... if you can find her. Pursued by the sorcerer Belasco, Magik faces the constant danger of succumbing partially or completely to her demonic, dark-magic persona, Darkchilde. There are people who fervently believe that Marvel is actively trying to sink the X-Men and Fantastic Four, forbidding their licensees from making any merchandise. Other people believe the Earth is hollow and we live on the inside surface, but no matter how hard you believe something, it doesn't automatically make it so. The only thing stopping Hasbro from making series after series of X-Men characters is that this isn't the early '90s and nobody cares that much. 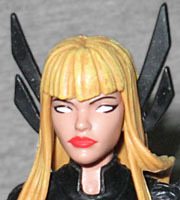 Magik, here, is an X-Men character. She's a mutant. She's the younger sister of Colossus, and blows yet another hole in the theory that Hasbro has been instructed not to make X-Toys. We've reviewed a semi-ML-compatible Magik in the past, but this is her modern incarnation, where she dresses in black leather booty shorts and a crop top from the Power Girl collection. She's mostly the teen girl body, with a new chest, hands, and left arm (because it's entirely covered in spiky grey armor). Apparently once Magik decides on a hairstyle, she sticks with it - the way she's got her hair cut now, with those super-straight bangs hanging all the way down to her eyebrows, is exactly the same way she had it cut as a child, as a magically-aged teenager, as a child again, when she died, and now that she's been brought back to life. That's commitment! Her eyes are blank white, and she has four odd spikes poking out of her hair. Are they horns? A crown? Something. Otherwise her hair falls to her waist. She comes with two swords - or more accurately, two versions of one sword, since they both have the same hilt. The Soulsword was created from a portion of her own essence while she was a prisoner in Limbo, and has been passed around quite a bit, but now that she's back to life, she controls it again. We get one version that is thin and unassuming, and a second that's as big as a Final Fantasy blade. The big one started showing up after AvX, so maybe it represents her post-Pheonix-enhancement power levels? Either that or it's like Tetsusaiga and blows up when it needs to. To Asgardian and mortal alike, one touch from Hela is fatal, drawing the spirit from the body and placing it under her control to do with as she pleases. Offspring of Loki and goddess of the dead, she frequently travels the Astral Plane. You must complete your training before facing the likes of her. Hela may be the goddess of death, but that's not all she has going for her. She's one of the strongest Asgaardians and an excellent combatant, capable of fighting Thor to a standstill. Befitting that level of power, she uses the giant female body that has so far only been seen on Red She-Hulk. There are a few new pieces, since she doesn't have an unzipped top or backless gloves, but the base is the same. She's got an amazingly ornate pattern painted on her front, and wears the cape that keeps her healthy and increases her powers; it's got plastic shoulders and the rest is softgoods. 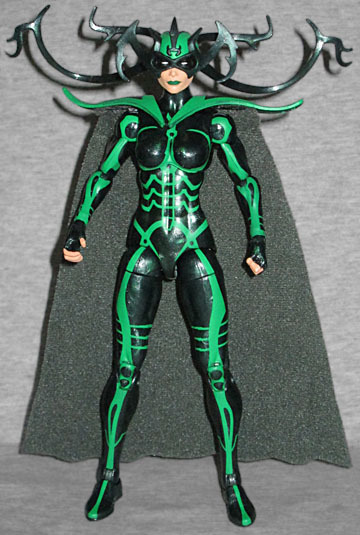 One consistency with Hela's design is that she has a ridiculously huge crown or set of antlers or something. They've been drawn in many different styles over the years, but they've always been there, so they're here, too. In fact, she not only has some that act like a mask, and a crest on her forehead, there are also two even bigger ones that you have to plug into the back of her head! Way to live up to the Kirby designs, toymakers! Hela's used a lot of different swords over the years, some with names and some without. 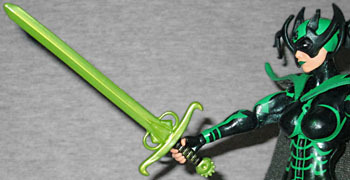 This one is the same mold Black Knight carried, done in a pale green to match her colorscheme. Her right hand is shaped to hold the hilt. If all that is not enough, the set also includes the Eye of Agamotto. Like the box itself, it's sized for human use. Which I guess makes you the new Sorcerer Supreme! (Which is really just a normal sorcerer with sour cream.) Pop it out of the (inexplicably flocked) tray, and it measures 3⅜" across, and has a tab at the top you can feed a ribbon through. For wearing purposes. It doesn't dispell illusions or smite your enemies, but it's still a decent inclusion for this set. 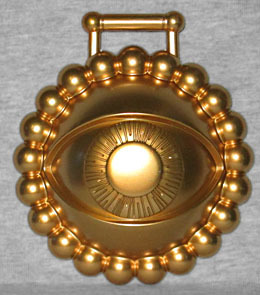 It's painted solid gold (after being molded in gray), rather than having any color for the eye as it sometimes did in the comics. A few years ago we joked that, following trends, the 2015 Marvel Legends exclusive would be a nine-pack, but with just Dr. Strange, Brother Voodoo, Dormammu, Magik and Hela, that clearly didn't come to pass. Although, Voodoo gets his powers from the spirit of his brother, so that's really two characters in one. And knowing Dormammu, those flaming skulls aren't just for effect, but are instead the real heads he tore off two people's bodies. And hasn't the Eye of Agamotto been shown to have some semblence of its own consciousness, before? So we've got five figures, plus one ghost, two victims, and one sentient artifact. Five plus one plus two plus one... nine-pack! Well played, Hasbro. 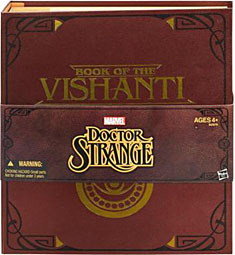 The Book of the Vishanti set only has one "repeat" character, making this a book you'll want to check out.